Today, we are happy to announce a new release of API Builder Standalone that has built-in credential management for external services. API Builder can manage OAuth 2.0 access tokens, API keys, and HTTP Basic credentials, which can be accessed within API Builder flows with the help of specially designed Authorization flow-node, or as parameters in supported flow-nodes. 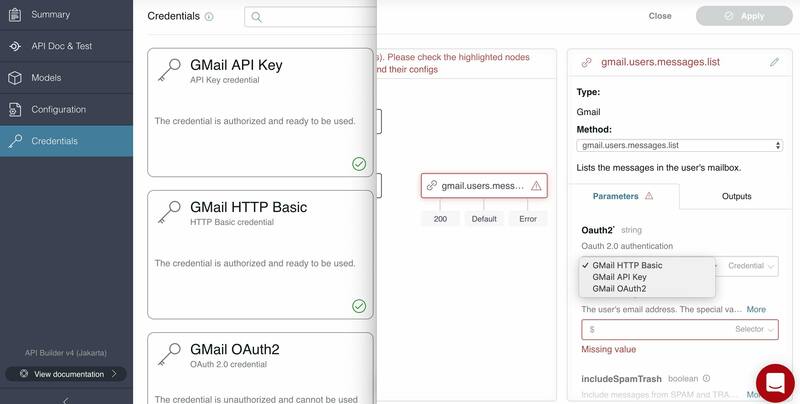 The credential manager can automatically renew OAuth 2.0 access tokens, meaning that you can worry less about OAuth 2.0, and focus on designing your business flows! If you have issues, questions, comments on this release, please leave a reply to this blog post.